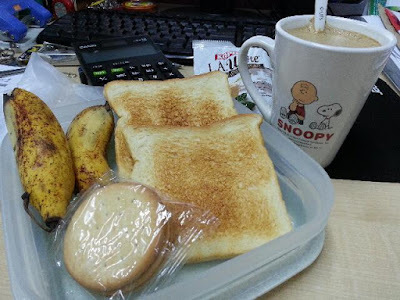 Munching lunch on office desk is a norm for me. There are limited choice of eatery around my office, I usually bring ready packed food from home or buy some bread or buns before I come to the office. I will have rice for lunch once in a while. Not for diet purpose but for convenience. Lunch time is time to take a break and surf the net. Yesterday's lunch, not as healthy but will keep me full till dinner time. A very simple and healthy lunch at work. What a simple and healthy lunch at work. Looks like a nice lunch to me. I used to take light lunch like yours too!